Greyhounds are the talk of the dog world at the moment, but they can be a little misunderstood. To set the record straight, we pulled together four common myths surrounding the beautiful greyhound breed. You’ll soon see why adopting one into your home might be the best decision you could ever make! I hated seeing Greyhounds being used for racing, but surely this still means they’re naturally super active and need loads and loads of exercise? We don’t blame you for thinking that Greyhounds would need loads of exercise, given all that running they’ve been forced to do in the past. However, the key word here is ‘forced’. The Greyhounds used in the racing industry were usually trained from birth to run – it wasn’t necessarily what they needed to be doing every day. In fact, it was quite the opposite! Greyhounds don’t need any more exercise than any other standard dog breed to be kept happy and healthy. As long as they’re taken for two walks everyday, they’ll be more than happy to just stroll along with you. I know it’s the law for Greyhounds to wear muzzles in public. This is because they’re really aggressive, right? Currently, it is a legal requirement for all Greyhounds to wear muzzles when they’re in public, unless a recognised assessment program like Greenhounds has given them exemption. However, this law was born out of the racing industry. It’s an extension of the Greyhound racing rules for race dogs living and being trained within the community. This rule is an example of Breed Specific Legislation that’s been put in place based on breed, rather than each dog’s individual behaviour. We think this is pretty unfair — there’s no evidence to show that Greyhounds pose more risk to the public than any other type of dog! When people see Greyhounds out in public wearing a muzzle, it contributes to the perception that they’re dangerous, aggressive, or snappy. This couldn’t be further from the truth. 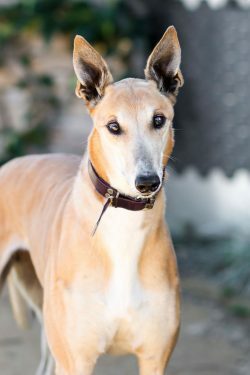 Greyhounds are generally friendly and have quiet, loving dispositions. Thankfully, compulsory muzzling requirements are currently under legal review. They need massive backyards to run around in, right? Contrary to popular belief, Greyhounds often don’t need a lot of space. This makes them perfect dog for apartments or small houses. Of course, every dog has different levels of energy, but generally speaking, Greyhounds love to sleep. They enjoy nothing more than just curling up on the couch with you. As long as they’ve got a private spot in the house or apartment to call their own, they don’t need a big backyard. They’re also very quiet dogs, so don’t tend to bark or vocalise very much. This should keep your neighbours happy! I’ve heard retired Greyhounds have problems with toilet training and learning how to socialise with other dogs. Can they ever get better at this? If you’re thinking about making the decision to adopt a retired Greyhound, congratulations. You might have just started the most rewarding and feel-good journey of your life! Greyhounds can, and do, make great pets. Unfortunately, retired racing Greyhounds can have issues socialising with other animals and people. They’ve been through a traumatic experience, and often haven’t been given the care and training they need to know how to behave properly. However, there’s absolutely nothing to say that you can’t work with them to help them improve and live a happy life with you. Be gentle, slow and encouraging through daily training with your Greyhound. You can include steady and careful exposure to other people and animals, and build up their confidence to make them more friendly. 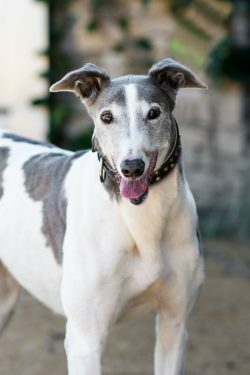 If you’re still having trouble after a couple of months, or your Greyhound is becoming more fearful, consult with a veterinary behaviour specialist. Remember, your furry friend won’t necessarily have grown up in a home environment, so you can’t expect them to automatically know how to behave in one. In terms of toileting, you can teach your Greyhound to go where you want him to go. Most dogs want to go after they wake up or after eating. Recognise the signs (whimpering, scratching at the door, walking around a lot, etc) and show him where he should relieve himself. Remember to always use lots of positive words and praise. Never punish your Greyhound if he makes a mess inside – patience is key. And of course, always give him plenty of opportunity to go to the toilet in the correct place. Who says you can’t teach an old dog new tricks! All in all, adopting a furry family member into your home is an amazing experience. And Greyhounds are a great option! They’re quiet, affectionate, minimal fuss and always there for a cuddle when you get home from work.